The Place Located on the second level retail arcade of the Rendezvous Hotel, just minutes walk from Dhoby Ghaut MRT Station, Shang Pin Hot Pot has been around for about two years. By this year end, the popular hotpot restaurant will be opening their second branch at Marina Square. A rather small restaurant, we spotted what’s perhaps less than 50 seats; simple decor, with maximising space and keeping costs low seemingly a priority here. We understood, not verified though, that Shang Pin started off by folks linked with Hai Di Lao, and we did see some similarities on their menu. 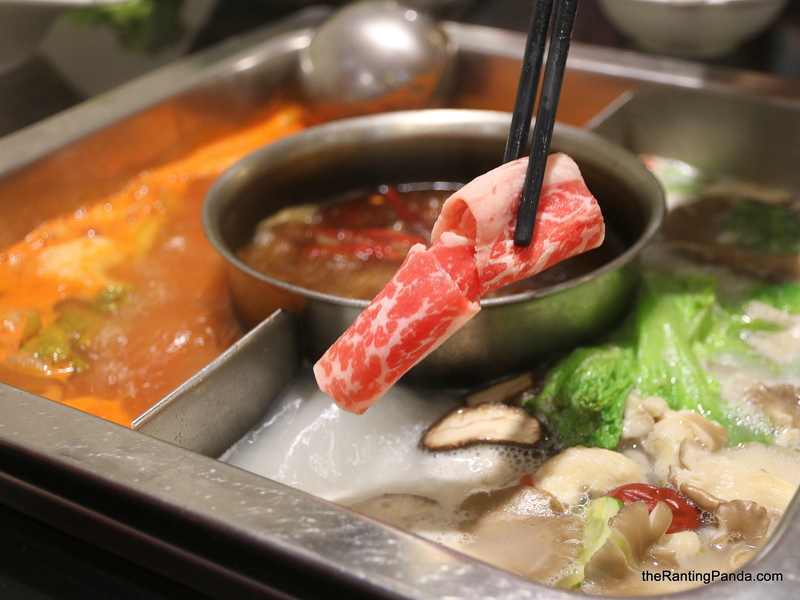 The Food Hot Pot, or Steamboat, enjoyed a silent revival in the past decade with many flocking to now-established chains to enjoy their pipping hot soup and fresh ingredients. Beauty in the Pot, Hai Di Lao, Jpot, Paradise Hotpot, Imperial Treasure Steamboat, are just some of the popular options now. Shang Pin completes this list, and has much similarities with Hai Di Lao in terms of soup base options and selection of ingredients – just a whole lot cheaper. Check out what are some of our other favourite hotpot restaurants in town! If you cannot make up your mind which soup base to go for, just select the Multi-Flavour Soup Pot (S$18). We went for the this and picked the Tomato, Chicken Herbal and Sichuan Spicy soup base. Personally, we preferred the tomato soup base, although if you are looking for a lighter soup option, the Chicken Herbal soup works better. We ordered both the premium cuts of beef and pork here – Shang Pin Beef (S$14) and Black Pork (S$10). I was surprised by the sizeable portions, very reasonably priced and fresh as well. As diners might seek variety, perhaps it would have been more ideal if there are half portion servings for the meats. We found the Pork Balls with Mushroom (S$8) slightly salty, although the chewy texture was on point. It does soak in the soup though, so you might want to avoid having this with the tomato base soup. Other orders we tried include the Chinese Dumpling (S$5), Lettuce (S$4) and the Oyster Mushroom (S$4). I was craving for Fried Tofu Skin (S$4), and unfortunately the skins were not the crisp versions found at Beauty in the Pot. Nonetheless, it was still enjoyable. The overall service here was good, with very prompt service. Our only gripe is the high charges for the self-service sauces, at S$3 per pax. Free-flow drinks are further charged at S$2 per pax. For a party of 2, the soup base, sauces and drink would cost S$14 per pax even before you order the dishes. Rants We wouldn’t mind if the restaurant could be kept cleaner, perhaps a reflection of the overall hygiene of the establishment? Will I Return Again? We love our hotpot, and despite having Beauty in the Pot as our all-time favourite, we continue to look for other alternatives. Shang Pin Hot Pot is definitely a feasible alternative for us going forward – with its accessible locations at Dhoby Ghaut (Rendezvous Hotel) and by this year end, at Marina Bay (Marina Square) too.